Can't attend? Follow Swiss Club, Singapore to know of future events! The everyone's favorite Swiss traditional breakfast is back, and this time it is going to stay for good! We are turning the Swiss z'Morge into a monthly affair, on every First Sunday of the month! 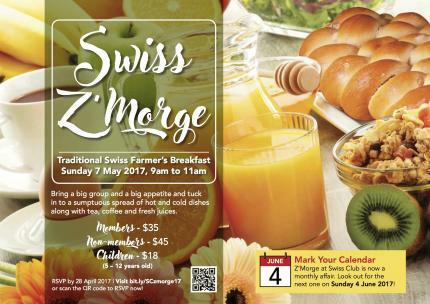 Join us at the upcoming Swiss z'Morge on the 7th May, 9am to 11am and indulge in the sumptuous Swiss traditional breakfast spread!